Well, we have yet another way to keep extra careful about not losing our mobile phones. 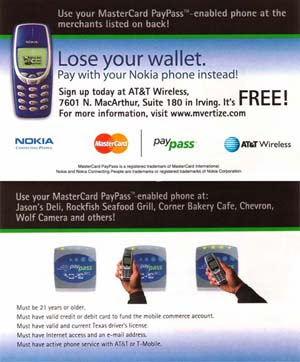 Seems MasterCard, and Nokia have gotten together to test a contactless payment program for mobile phones. A few select Citi MasterCard holders will receive a Nokia mobile phone equipped with the MasterCard PayPass payment function and with NFC technology. Just hold your phone up to a special card reader, and whatever you owe is automatically deducted from your account. PayPass technology is already being used in many major cities as a way of expanding the reach of credit card payments; but this test in New York, is the first major run of the technology using mobile phones in the USA. This is nothing new in Asia, of course. DoCoMo, in fact, would find this a bit of a yawn, since they've been at this sort of thing for a couple of years now. Many of these transactions, though, are debit-like and for small sums. One could conceivably use the PayPass mobile phone capability to buy an iPod, a big piece of furniture, or even a car;”whatever your credit limit can afford. Samsung and Motorola are on the case as well. Motorola, in particular, is pursuing an M-Wallet service that will allow merchant payments and also perform banking functions. Assuming that the New York tests are satisfactorily concluded, we can expect to see this sort of thing in the broader market sometime next year. As we warned you from the outset, hold onto that mobile!